The first thing that comes to mind when someone mentions gelatin to you is dessert, but most gelatin is a meat by-product. As such, it works equally well in savory dishes as it does in desserts and molded salads. Although most commercial gelatin sold is made from animals, there are forms of gelatin to fit all types of diet restrictions, including vegetarian and kosher. Gelatin has many applications. It can be used in sweet and savory dishes. Since unflavored gelatin is 85% protein and low in calories, it is an excellent choice for dieters. For diabetics, sugar-free flavored gelatins using sugar substitutes are widely available. Some raw fruits can completely break down gelatin and render it useless, so read about which ones to avoid below. Do not add fresh or frozen pineapple to gelatin or Jell-O. These fruits, along with raw figs, kiwi fruit, guava, and ginger root, contain an enzyme called bromelain which breaks down gelatin causing it to lose its thickening properties. The enzymes are deactivated in cooked fruit, so canned pineapple and kiwi are fine to use. Too much sugar also can inhibit gelatinization. The more sugar in the recipe, the softer the resultant gelatin will be. Other liquids can be used in place of water to prepare gelatin, including fruit juices, clarified vegetable or meat stock, vegetable juices, and broths. Thicker stock and a more delicate flavor results from using veal bones rather than other meat bones since the veal has more collagen which gels the stock. For every 2 cups of gelatin mixture, allow 1 to 2 cups of solids, either minced, cubed, or cut into small pieces. Be sure to drain all solids of their liquid before adding to gelatin to avoid watering down the gelatin. To suspend fruits, meats, or vegetables in gelatin, chill the gelatin until it is the consistency of cold egg whites. Then mix in the well-drained additions and chill until completely set. Use 1 envelope (1 tablespoon or 1/4 ounce) unflavored gelatin to 2 cups of water for standard firmness. Decrease or increase water or other liquid for your particular needs. One (3-ounce) package of flavored, sweetened gelatin needs 2 cups of water. If you are doubling a recipe originally calling for 2 cups of liquid, use only 3 3/4 cups of liquid instead of 4 cups in the doubled recipe. If you are using leaf gelatin instead, 1 tablespoon of unflavored powdered gelatin equals 4 sheets of leaf gelatin. For a gelatin that will unmold easily, before filling the mold, spray it with cooking oil. If you want to avoid an oily film which might cloud the surface by using an oil spray, simply rinse the mold with cold water prior to filling. When unmolding, dip the mold into warm (not hot) water to the depth of the gelatin for 5 to 10 seconds, loosen edges with a knife or spatula, and unmold. Return to the refrigerator for 20 minutes to firm. To easily center a mold on a plate, rinse the plate with cold water before unmolding the gelatin onto it. This way, it will slide easily into the right position. Store gelatin desserts in a covered container to avoid the formation of a thick rubbery skin on the surface. 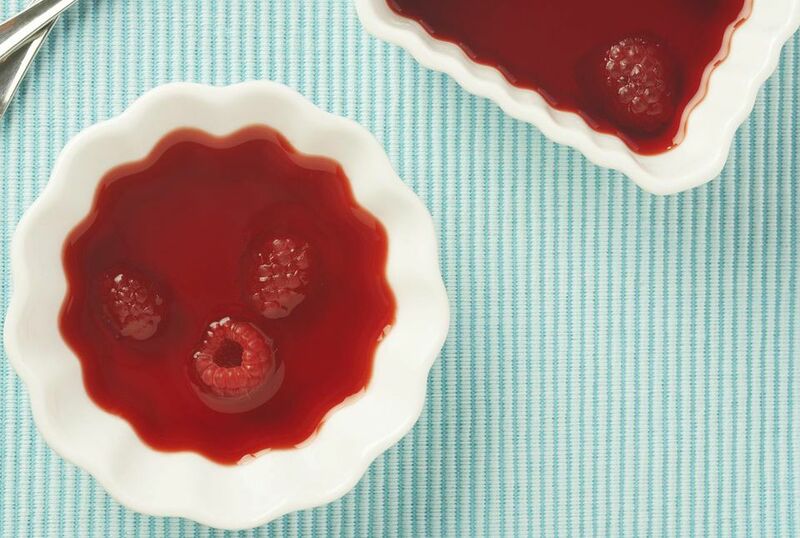 Keep gelatin dishes refrigerated until ready to serve to maintain their gelatinous state. Unprepared gelatin has an indefinite shelf life as long as it is wrapped airtight and stored in a cool, dry place but it might clump and that is okay. To "unclump," dry unflavored gelatin should be mixed with a little cold water first for 3 to 5 minutes to moisten and separate before adding the hot water. When using sugar with unflavored gelatin, mix the sugar and gelatin first before dissolving. Gelatin takes twice as long to dissolve when used with cream or milk. Do not bring gelatin mixtures to a full boil or you risk losing their thickening properties. You can successfully meltdown (gently using a double boiler) and re-chill gelatin several times before the mixture loses its thickening ability. Two hours of chilling should be enough for standard clear molds, while it may take up to 4 hours for those with additions. Layered gelatins will take longer since each layer must be individually chilled and firmed before adding the next layer.